Did you know there are 80 pieces of artwork you can view at the Pfister Hotel in Milwaukee? Did you also know they are hosting a variety of literary events? It's easy to think of hotels as simply a place to stay while traveling or as a destination for a wedding. Sure, travelers come and go and many lovely weddings take place at the Pfister, but they offer so much more. The Pfister is a place filled with stories just waiting to be told by the Narrator. 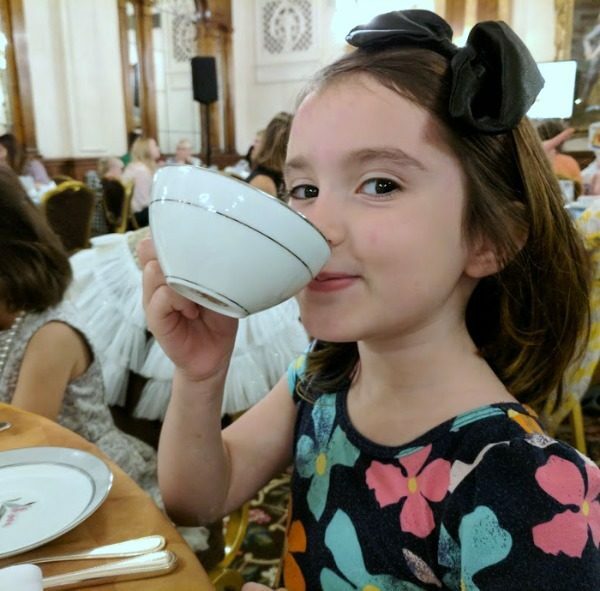 My daughter and I received tickets to attend the Alice in Wonderland Tea Party, the first in a series of literary events at the Pfister Hotel. For years, I've driven past the Pfister on several occasions. I knew it was a nice hotel, but had never been inside before. As my daughter and I entered, we were immediately struck by the beauty of the place – from the carpet to the ceiling. “This place is so fancy!” my daughter whispered. It didn't take long before our gaze turned upwards. (I'm always drawn to gorgeous light fixtures.) We marveled at the beautiful painting on the ceiling as we waited in line to check in for the tea party. 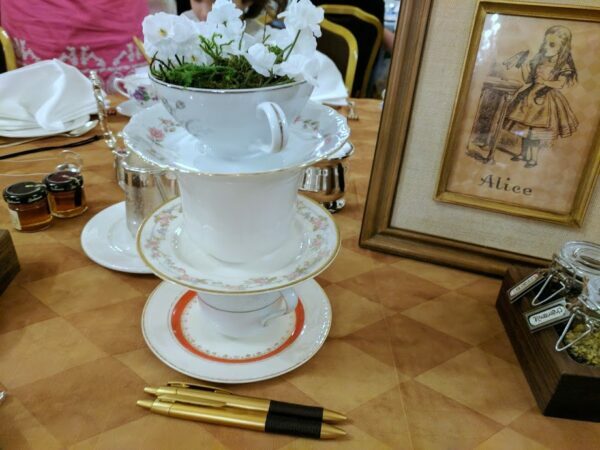 My daughter and I were seated at the “Alice” table at the Alice in Wonderland Tea Party. The movie was playing in the back corner which provided a nice break for the kids. There was also a lovely garden photo backdrop complete with oversize flowers. 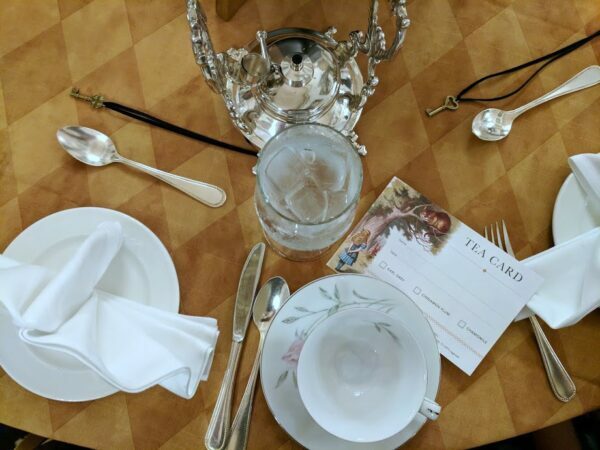 The Pfister Narrator, Nicole Mattke, read a few sections of the classic story while we enjoyed a nice tea service. This event was the right amount of fancy yet kid-friendly. For example, children could choose hot chocolate rather than tea and they served ham and cheese finger sandwiches in addition to the other light bites. It was the perfect opportunity for one on one time with my daughter. I recommend trying the Cinnamon Plum tea – it was delightful. A few days after the event, I had the opportunity to speak with Nicole Mattke about her inspiration for these literary events. As the Pfister Narrator, Nicole writes about every day life and shows how amazing it is on the Pfister blog. She welcomes both guests and locals to reach out to her at hotelnarrorator@gmail.com with stories about their life as well as special Pfister memories. As part of her Narrator role, Nicole wanted to focus on creating a literary culture at the Pfister to make reading fun for both kids and adults. Being a mom of four, she understands the struggle of attending kids events where parents are mostly just waiting for it to end. She wanted to create an event that shared reading with children and was engaging for adults as well. 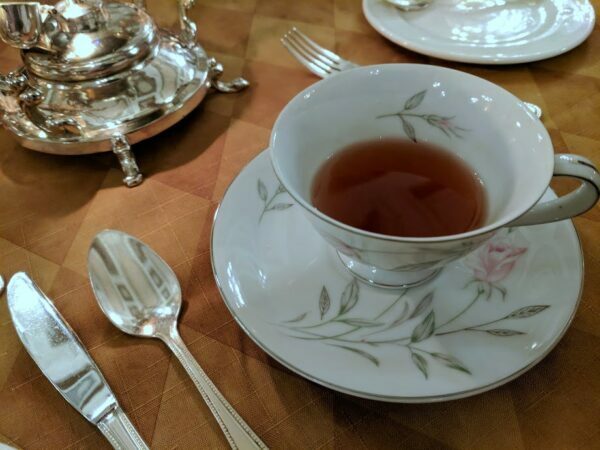 Growing up, attending tea service at the Pfister was a holiday tradition with her mother and sisters. Taking that fond memory, she added a special twist which resulted in the first Alice in Wonderland Tea Party. The next literary event will be An Afternoon on the Polar Express on December 10, 2017. Take the kids on an enchanting journey as this classic story is brought to life. Children will love the hot chocolate bar, activities, and attending in their pajamas! Nicole also hinted at an upcoming Sherlock Holmes Mystery Event for adults. I can't wait to learn more about that! Want to discuss good books with others while enjoying complimentary wine and desserts? Then mark your calendar! The Pfister Book Club meets on the second Thursday of the month from 7PM to 9PM. This casual book club has 40 active participants who would love to chat about books with you! Learn more about upcoming book club meetings and other events at the Pfister here. The Pfister Hotel is a lovely place filled with art, culture, food, and fascinating people. There are several things you can do there without staying as a hotel guest, such as walking around to view their art collection or grabbing a bite to eat. We hope the next time you think of the Pfister, you think of more than simply a hotel with rooms for weary travelers to lay their heads. Have you ever gone there for an event? Tell us in the comments – we would love to hear about it!